The only landing page platform that offers an integrated collaboration solution. Now your team or agency can create landing pages at scale, collaborate in real-time, and put an end to repetitive, time-consuming delays that slow your campaigns. Watch this video to see how easy collaboration can be. Eliminate the time-consuming bottlenecks inherent in the design review process. Provide feedback directly by clicking on specific design elements. Securely invite clients to review your designs and give feedback. Respond to comments and tag team members to instantly notify them. Resolve issues and remove feedback threads on completion. Include your organization’s legal and/or compliance teams as needed. View notifications for all landing pages in the Message Center. Go from brief to campaign launch faster. Get real-time feedback from your team and clients. Increase revenue and client satisfaction. Complete projects faster. Consolidate feedback directly on the landing page instead of emails, screenshots, and more. Avoid costly delays. Keep an open channel of communication with your clients for quicker turnarounds. "A reality we often face is that design and review processes are far too fragmented, especially when you’re managing multiple collaborators, campaigns, clients, and deadlines. 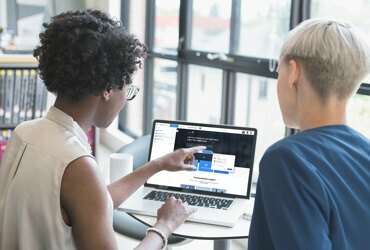 Instapage has taken that insight and created a landing page platform that all teams will need if they want to improve their workflows."